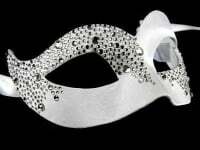 The Fantasia Lady Filigree Mask in white with stand-out embellishments is designed to turn heads. Let the party begin. Strictly Limited Edition, the Fantasia comes with a Certificate of Authenticity. It is made in Venice from the mask makers who supply all the stunning masks we have available for you to buy. The Fantasia features white, laser cut metal and genuine Swarovski crystals set against a background of white and gold with a subtle glitter effect. 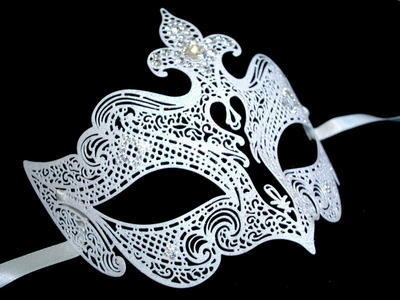 Because the ornate pattern is precision cut, no two masks are alike and your costume will be individual. Satin ties allow your mask to be adjusted to fit around your head, keeping it securely in place all party long. The filigree style is lightweight and comfortable to wear. The Fantasia will be delivered straight to your door, post and packing is free. Why not order yours today?